The “Urban Homestead” is a phrase that goes back to the 1970s and has become a common phrase in the US for describing a home which is aiming for self sufficiency and self reliance. It has a lot in common with the Permaculture and Transition movements, at the very least sharing some goals and techniques. 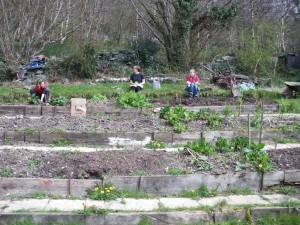 The handbook for the movement is The Urban Homestead by Erik Knutzen and Kelly Coyne – a very fine read it is too. They’ve got problems at the moment though, and here’s why. The Dervaes family in Pasadena have run an urban homestead for over twenty years, and have made such a business out of it that they decided to apply for a trademark for the phrases Urban Homestead and Urban Homesteading. Remarkably they were granted them despite the mountains of prior usage. Now they’ve sent out what they consider to be polite reminders to people not to step on their trademark – unfortunately one was sent to Facebook with regard to Erik Knutzen and Kelly Coyne’s page about their book, and Facebook promptly took the page down until the dispute is resolved. The Electronic Frontier Foundation have stepped in and are acting on behalf of Knutzen and Coyne to fight the takedown notices. There’s also a Facebook campaign to spread the word about urban homesteading and make sure the Dervaes’ family don’t succeed in co-opting it for themselves. Hence this page. Good sources of information are Boing Boing (as ever) and the OC Weekly, the local paper in Pasadena with a charming fondness for words like “dingbats”. Update: It took six years but the EFF finally got the trademark cancelled!